Phew, that was a long title. But these cookies deserve it. Now before you go clicking away because this recipe doesn’t include real chocolate, let it be known that I, a dark chocolate is aways better kind of gal, really love these cookies. I bookmarked them a few weeks ago because they sounded like an interesting variation to the monotony of chocolate chip, but when the weather reached 80 degrees in March (in Ohio! ), I really had no choice but to make tropical cookies. I also reasoned that since I’m not a huge white chocolate-macadamia nut lover, these cookies would be safe to have around the house. Ha. I wish I could tell you that I didn’t eat 6 for breakfast one day. After that incident, I was almost afraid to make them again, but I also felt guilty letting the left over macadamia nuts go to waste (they were the most expensive part of the cookie). So I decided to make a half batch the second time around. Well wouldn’t you know- when I went to toast the leftover macadamia nuts, I burnt them to a crisp. I swear, one moment they were white, and 20 seconds later they were black. What can I say, “I got it from my momma”. Toasting nuts just isn’t in our blood :-). But since I had all the other ingredients mixed together, I decided to improvise with some slivered almonds. The cookies still turned out pretty amazing so if you are trying to cut cost, try some slivered almonds as a substitute. Also don’t be afraid (like I was) about putting 2 tablespoon of lime zest, you need at least the entire rind from one lime just to get some lime flavor. 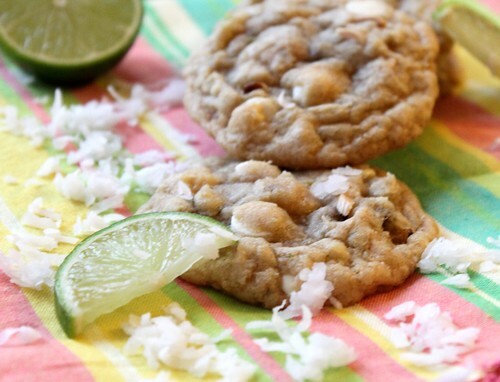 If you can imagine what a lime pina colada would taste like, I think it would be these cookies. They will definitely be making a reappearance this summer – barbecues, pool parties, breakfasts, etc. Melt 10 tablespoons of the unsalted butter, then add the remaining two tablespoons and stir until smooth (This helps the butter return to room temperature quickly). Heat oven to 325 degrees. Mix flour, salt, and baking soda together in medium bowl; set aside. Either by hand or with electric mixer, mix butter and sugars until thoroughly blended. Mix in egg, yolk, and vanilla. Add dry ingredients; mix until combined. 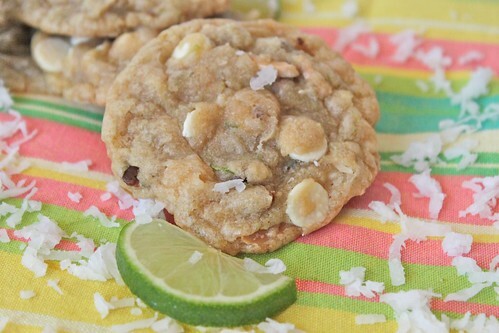 Add white chocolate chips, coconut, macadamia nuts, and lime zest. Mix to distribute. Scoop cookie dough into large balls and place on parchment lined baking sheets. Bake until cookies are set around outer edges, yet centers are still soft and puffy, and appear slightly under-baked, about 10-12 minutes. Cool cookies on cookie sheets for a few minutes and then transfer to a cooling rack. I honestly had no idea what to expect from this pizza. I had a hundred different directions I was thinking of going with it and I was worried that by trying to combine too many different flavors, I would end up with a disaster. I put this on the menu for last week, but I think my fear of failure along with some good rationalization about NEEDING to have summer fun caused me to go out to eat 5 days last week. (In my defense I think that’s a personal record, plus once everyone buckles down with school, it will be at least a little bit harder to hang out :-)). 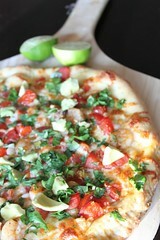 Finally, I decided that I couldn’t let avocados, tomato, cilantro and limes go to waste, so I concocted this specialty. 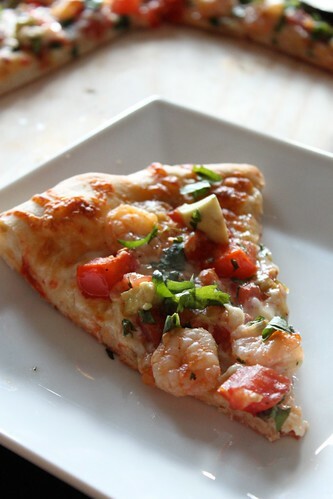 Well as you can probably guess based on the fact that I am putting it on the food blog – I really liked this pizza! It was unique, fresh, flavorful and used up the leftover shrimp I had in the freezer. (I have a bad habit of buying shrimp and only using half the bag.) I also used some of the pizza dough I had frozen, which made this pretty easy to put together. I almost skipped adding the chipotle, but I’m so glad I didn’t because I think it made the meal. If you are a bacon lover, I think that could also be a nice flavor complement, but I felt like it had enough ingredients without it. The only part that takes some time is chopping, so I would recommend doing it at the beginning so you can just go “chop crazy” all at once. P.S. chopping veggies is a pretty awesome way to wind down! 1. Preheat oven to 475°, preferably with a pizza stone. Roll out the pizza dough. Brush with 2 T. olive oil and 4 cloves of minced garlic. 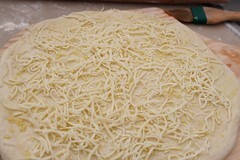 Then spread cheese evenly over the top. 2. In a medium sauté pan add 1 T. olive oil and bring to medium-high heat. Add remaining 2 cloves of garlic and stir until fragrant. 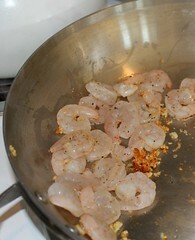 Then add the shrimp to the pan and stir for a 1-2 minutes. 3. 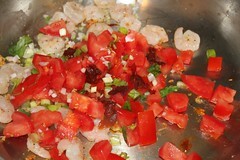 Add the tomatoes, scallions and chipotle peppers to the pan, and sauté for an additional 2-3 minutes to soften the tomatoes and flavor the shrimp. 4. 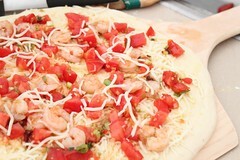 Spread the shrimp mixture over the pizza, and add a little bit of cheese on top if you feel like it. 5. Bake at 475° for about 15 minutes or until golden brown. Remove from oven and immediately top with cilantro and avocado. 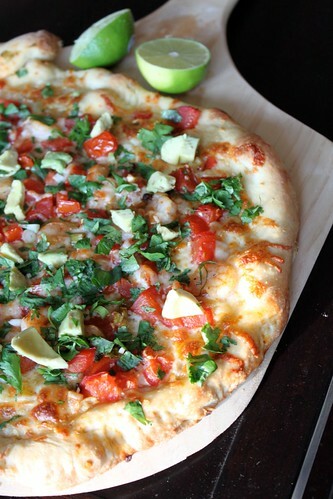 Squeeze lime juice over top of the pizza and serve. A Spice is Nice Original.